Join us at Lincoln Lanes, August 13-16 for poker tournaments and cash games. Once again we’re working with TJ’s Charity Poker Room and a portion of the proceeds benefit the Greater Grand Rapids USBC. August 13 – Doors open at 4pm for cash games. Tournament starts at 6pm is a $20 Build-A-Stack game. 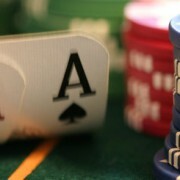 Players can buy more chips while playing. $20/$10 Rebuy Tournament. August 14 – Doors open at 4pm for cash games. Tournament starts at 6pm is a $50 Deep Stack Freeze Out event. 25,000 Chips. August 15 – Doors open at 4pm for cash games. August 16 – Doors open at 2pm for cash games. 2 Tournaments on Sunday.